‘Oh, the grand old Duke of York he had ten thousand men, he marched them up to the top of the hill and he marched them down again…’ You may recognise this popular nursery rhyme but did you know it was rumoured to be Sandal Castle that the Duke of York marched up? Have a relaxing stroll around the castle grounds and learn about the rich heritage of the site. Extend your walk and see the castle from a different angle as you follow the trail that leads to Pugneys Country Park. Pause for a drink and a bite to eat at the café before making your way back up the hill to the castle. Free limited parking is available on site. 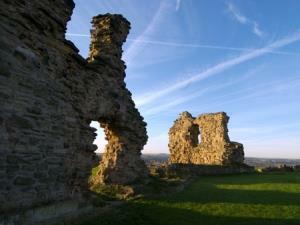 Sandal Castle grounds are open to the public all year round. Limited car-parking is available. Overflow parking is available at Manygates Centre for selected evening events only. Coaches are asked to drop off and park at Pugney's Country Park. (Tel: 01924 302 360 for details).